103. Indicate which colleges you want to receive your FAFSA information. Enter the six-digit federal school code and your housing plans for each college or school you wish to receive your FAFSA information. You can find the school codes at www.fafsa.gov or by calling 1-800-433-3243. If you cannot obtain a code, write in the complete name, address, city and state of the college. All of the information you included on your FAFSA, with the exception of the list of colleges, will be sent to each of the colleges you listed. In addition, all of your FAFSA information, including the list of colleges, will be sent to your state student grant agency. For federal student aid purposes, it does not matter in what order you list your selected schools. However, the order in which you list schools may affect your eligibility for state aid. Check with your state grant agency for more information. To find out how to have more colleges receive your FAFSA information, read What is the FAFSA? on page 2. The School Selection section asks which schools you’d like to send the FAFSA information to in order to help you secure funding, scholarships, or additional financial aid. You may select up to ten schools. To do so, enter the city, state, and name of the college OR enter the Federal School Code. If you do not know your intended college’s Federal School Code, and would prefer to use it rather than the search feature, you will most likely be able to find it on the intended college’s financial aid website. NOTE: Using the FAFSA on the web, you can log in to your submitted application and add another school in the Student Eligibility section. There is a 10 school limit, so if you had previously sent your FAFSA to 10 schools, you will need to remove them from the list and add your new school. This action will not withdraw your FAFSA from those other schools. It does not make any difference if you search for the colleges you intend to send the FAFSA to by city, state, name or by using the Federal School Code. 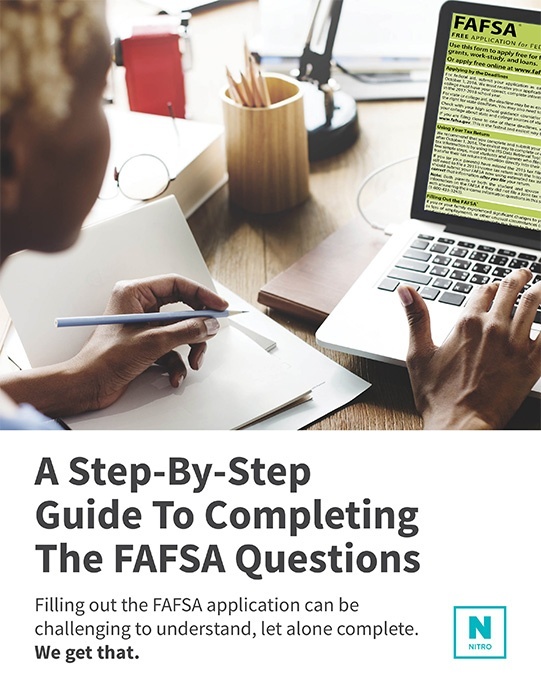 A Step-By-Step Guide From A Financial Aid Expert!